People take hundreds of million electric rides each year in California. The big news is not the electric car drivers or those happily screaming on Disneyland rides; the larger story is network of connected electric rail, buses with cutting edge electric drive systems, and electric cars. No LA and SF are not yet NY or Paris, but they are showing off a future of low-carbon and zero-emission transportation solutions. A couple of weeks ago, I went to the highly informative CAPCOA Climate Change Forum which included a couple of hundred leaders from California government, industry, and non-profit. Many of these people have decades of success in improving the health of our air, water, and environment. Now they are taking on the tough challenge of reducing the greenhouse gas emissions of a state that emits more than entire nations such as Spain, or Saudi Arabia, or hundreds of smaller countries. The number one GHG emitter in California is vehicles. Add the emissions of its oil refineries and you have the majority of greenhouse gas emissions in California. To the rescue are major public transportation operators who are electrifying their rail and bus fleets. These transit operators are unclogging the roads for those who really need cars, reducing air pollution, and reducing California’s carbon footprint. In fact, I got to the Climate Change Forum on an electrically powered bus. I walked two blocks and boarded a trolley bus connected to special overhead power lines. The electricity is from hydropower. San Francisco has over 300 electric trolley buses, 40 cable cars that use under-street cables powered by electric-motors, an extensive electric light-rail system, and 460 diesel buses which are increasingly hybrid-electric. Like most cities, no one mode is best for the 235 million rides taken in SF each year; what’s best is a portfolio of solutions. Electric light-rail is popular in many cities. Sleek cars on rail invite people to hop on and off. On their dedicated rail lines they are often the fastest way to get to a city’s major destinations. The rail cars often last 40 years compared to diesel and trolley buses which may only last 12. Only a handful of transit operators still use the electric trolley buses with rubber-tired vehicles powered by electricity collected from fixed overhead wires. San Francisco and Seattle actively use trolley buses; cities like Boston and Dayton have a few. These buses, connected to overhead electric lines, fight through the car traffic, stop at every red light and stop sign, and require slower boarding than light rail. Transit operators no longer like electric trolley buses. They like the long life, speed, and ridership appeal of electric light-rail. Trolley buses cost more to buy and maintain than diesel hybrid-electrics. Unfortunately, adding a light-rail line can cost $20 million per mile; in a city like SF, $60 million. A good combination for public transportation is light-rail corridors for the most heavily traveled segments that is well integrated with bus service, bicycling, walking, car sharing, electric car parking, and other modes. My wife and I are planning to buy an electric car with 100 mile charge range. That more than meets our daily needs. If you’re driving a 40-foot bus full of people for 12 to 16 hours daily, however, you probably need more than batteries to extend the range to 300 to 400 miles. Hydrogen fuel cells compliment lithium batteries by freeing electrons from hydrogen to feed electric motors and batteries added electricity. Finish the long day with a 10 to 15 minute fill-up of hydrogen and your ready for another day. AC Transit is currently servicing some Berkeley and Oakland routes with 4 hydrogen fuel cell buses with pure electric drive systems with 8 more on order for the Bay Area. These workhorses go for hours on end, even taking battery draining steep grades. These Van Hool buses use Siemens electric motors, EnerDel lithium batteries, and UTC fuel cells. AC Transit Director Jaimie Levin reports that their UTC fuel cells have worked so well, that they will redeploy several of the older fuel cells in the new buses, even though they have in excess of 7,000 hours of continuous operation on each system, without any failures or repairs, or loss of power. The AC Transit fuel cell buses provided an inspiration for the Winter Olympics. At CAPCOA, I talked with Dr. Paul Scott, ISE Chief Scientists about the 20 hydrogen fuel cell buses that were used in Whistler for the Vancouver Winter Olympics. Dr. Scott told me that those BC Transit buses have successfully logged 500,000 km in a few months. I estimate that they provided over 100,000 rides during the Olympics. The Vancouver New Flyer buses use Ballard fuel cells, Siemens electric motors, and ISE drive systems and software. Metro serves a vast geography that extends to the far reaches of the Los Angeles basin. I rode their system for a week, traveling from remote Pasadena to the LA Convention Center faster than I could drive. At the heart of Metro is an electrically powered subway and light-rail system. From those main arteries, 2,500 CNG buses reach streets and neighborhoods that could never be covered with electric rail. In the long term, up to 40 percent of these CNG buses could be replaced with battery-electric buses for rush hour coverage. Although CNG buses have a range of at least 300 miles and can stay on road for 16 hours daily; battery electric buses are well suited for six to 8 hours of daily use during peak service periods. LA Metro plans to pilot test an electric bus with 300kW lithium battery pack, giving it 100-plua mile range appropriate for peak hours. The Ecoliner silently glides along the streets in San Gabriel Valley giving passengers a break from the famous grid-lock traffic that extends east from Los Angeles for a hundred miles. The Ecoliner is Foothill Transit’s new pure battery-electric 35-foot bus built by Proterra, which is headquartered in Golden, Colorado. The Proterra BE35 is propelled with UQM electric motor using innovative lithium batteries that keep the big bus moving for 3 hours and are then quick-charged in ten minutes. The buses range is extended because the Proterra is aerodynamic made with lightweight composite material. 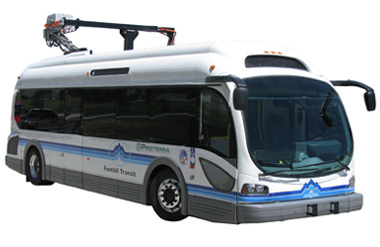 Proterra’s system allows a battery electric bus to pull into a transit center terminal or on-route stop and automatically connect to an overhead system that links the bus to a high capacity charger without driver involvement, even while passengers load and unload. The charging station technology includes advanced wireless controls that facilitate the docking process and eliminate any intervention from the driver. Proterra’s FastFill™ charge system is comprised of the software and hardware to rapidly charge the TerraVoltTM Energy Storage System from 0% to 92% energy charge efficiency in as little as 6 minutes. Under California’s zero-emission bus program, 1,000 zero-emission (fuel supply to wheels) buses will be in service by 2020. Metrolink rail and the Subway link some major Southern California light-rail and bus systems and BART and Caltrain link some Northern California systems. As a rider of these systems, I can testify that navigating through multiple systems is often slow and confusing. Using Google Maps on my smartphone makes the navigation possible. In the future, California’s 25 major transit systems will be linked with an 800-mile high-speed rail network. Voters approved the system because it is a less expensive solution than widening highways and expanding airports. Because it depends on local and public-private partnership funding, as well as state and federal funding, it will be built in sections. First online are likely to be areas that are currently overwhelmed with passenger vehicles crawling on freeways that should be renamed “slowways.” Likely to be among the first in service are the Orange County – Los Angeles section. California is electrifying cars, transit, and high-speed rail at the same time that it expands its use of renewable energy including wind, solar, geothermal, hydro, agricultural waste, and even ocean power. The transition may reduce the state’s overwhelming dependency on petroleum for over 97 percent of all transportation. By comparison to other nations, California is the third largest market for petroleum. Only the USA as a whole and China use more. California uses more petroleum than Japan, Germany, India, and other nations. Currently California leads the nation with 25,000 electric cars on the road and thousands of new electric charge stations are scheduled for installation. Hundreds of millions of rides are taken on electrified light-rail and commuter rail. Zero emission buses are on the roads. Renewable energy is growing by gigawatts. In a few weeks, we will learn if California moves ahead with efficient and electrified transportation, or if its initiatives are derailed. Re: “40 cable cars that run on gravity,” the cable cars do not run on gravity, but are pulled along by an under-surface cable, which itself is pulled under the streets by an electric-motor-driven winding drum. Hal, thanks for the education about cable cars. The article is now corrected.